John is still on his mission. 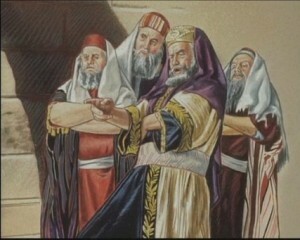 The Pharisees and Sadducees came to check out what was going on. Were they there looking for a “crazy” man? Were they looking to discredit his teaching? Were they going to try and challenge his authority? John certainly didn’t believe they were there to receive his teaching and baptism. He called them snakes! Another word for snake is serpent. Satin disguised himself as a serpent in the Garden of Eden. These serpents were disguising themselves as religious leaders. Both deceptive and deadly! He also addressed their LONGSTANDING claim to ownership of all God had/has to offer. THEY were the chosen people. THEY alone had direct access to God, especially as the religious leaders. John effectively told them that God would rather start over with the rocks lying on the ground to be His emissaries than to let them keep going the way they had been doing. They were corrupt and NOT representing God’s interests and requirements to the people. He let them know that God had already judged their system, as well as them individually, and found them to be damaging. They were not just unproductive or unfruitful but were producing fruit that was dangerous and deadly and had to be dealt with through destruction. Does this mean that there was no hope for the individual from their order? No, because we see several of their number (Nicodemus, Joseph of Arimathea, and Saul/Paul to name a few) believed in Jesus and His teachings. They all changed, repented, and “[bore] fruits in keeping with repentance.” Nicodemus and Joseph did so secretly for fear of the others around them. Saul showed mightily that he believed Jesus’ words and bore amazing fruit through Him. I think about what kind of fruit I am bearing. So often I fall short of “good” fruit. I notice this especially when I’m getting frustrated and angry about things. Today is a prime example of it. I was TRYING to get a simple part for my husband, Steve’s, CPAP (ours is an IVAP, the “Cadillac version”) replaced. This story actually started a week ago. Sunday a week ago, I was doing the weekly maintenance on his machine. It requires me to disassemble several parts of it. Steve usually doesn’t even register this activity, but this time was different. He saw one of the pieces sitting on the machine itself and thought it didn’t belong there. He picked it up and put it SOMEWHERE. I discovered it missing and went searching. When asked about it, he remembers moving it but has no idea where he put it. I became very agitated by this and didn’t show ANY appropriate spiritual fruits. My basket was filled with rotten apples and I was chucking them at him verbally (not with foul language but with short and frustrated comments). DEFINITELY not what God would call “fruits in keeping with repentance.” Granted, this wasn’t a “repentance” incident for myself but my attitude should have reflected the same kind of grace God shows me when I mess up. Today, while trying to order a replacement part for the one that vanished, I was making rotten apples again. I was trying very hard to keep my “apples” from becoming destructive to those who were literally sending me around, and Around, and AROUND the same channels I had already unsuccessfully been through. After spending about 90 minutes navigating the “customer service” quagmire, I finally got my concern escalated to someone who could help me. I had to wait for a call back, but when it came, it took less than five minutes to solve my problem. The unintended result of my problem was that my husband again felt shame and guilt over misplacing the part in the first place. I never mentioned why the part needed replaced during my interaction with “customer service” but he overheard my frustration when dealing with them. My basket, again, was filled with “rotten apples” and they were landing at his feet. This was NOT my intent! But it is the result of my not dealing more effectively with the “tree” I keep getting my fruit from. My tree is full of frustration and anger lately. This is SO clear to me right now. God, I need Your help in dealing with this issue in my life. I don’t like seeing this fruit in my life. I have been unsuccessful in routing it out myself, no matter how hard I try. I need You and Your skills to cut into my heart and remove this root. And when You do Your surgery, get it ALL please! I don’t want any of it growing back. I hate how easily I am moving from normal to frustrated on a daily basis. It is hurting me and those I love. I’m TRULY sorry God and am ready to show REAL fruits of repentance. I know soooooooooo well about rotten apples! Grace and Peace to you, Annette–indeed to us all–as we root out the underlying issues that cause us to go back time and again to the poisonous tree.